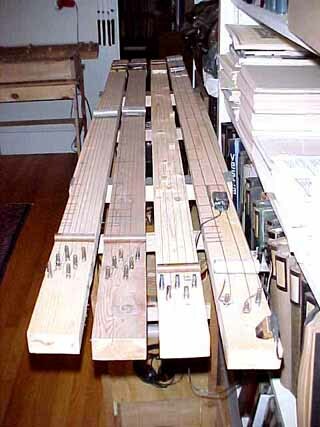 Buzz Kimball is a composer and instrument designer living a quiet life in rural New Hampshire. His thought-provoking articles on instrument design and craftsmenship have been featured in Experimental Musical Instruments. Over the years he has created a remarkable and extensive variety of stringed and struck instruments, both acoustic and amplified. He is a member of Ivor Darreg's Xenharmonic Alliance and visited with Ivor in 1981. His record label, Novosonic, carries his numerous CDs.